This review exposes the investment scam of Finpe Automobiles Limited. Finpe Automobiles is a company that allegedly trades with used cars. This industry is supposedly flourishing so much that they can offer you investment plans to make money. Returns on investment start at 3.25% daily and go up to 90% per day. Does it look real? First of all, a company that trades car cannot offer investment services. At least not without a special licence from the Financial Conduct Authority, since it is based in the UK. Finpe Automobiles has no licence whatsoever. And we seriously doubt the company is real. Sure, it has a tax registration, but we believe that it is not doing any real business, like trading cars. Even if Finpe Automobiles was trading cars, it still would not be able to make you anything close to 3 or more percent per day. Doubling your money every month for free like this is impossible, let alone daily. That’s just not the kind of money any legit business can generate. It is clear that Finpe Automobiles is a scam. It might behave as a Ponzi scheme and pay out some profits at the beginning, just to attract more investors, but it will fail in the end, it’s just a matter of time. This is because it is just redistributing the money it collected, there is no real business activity going on. 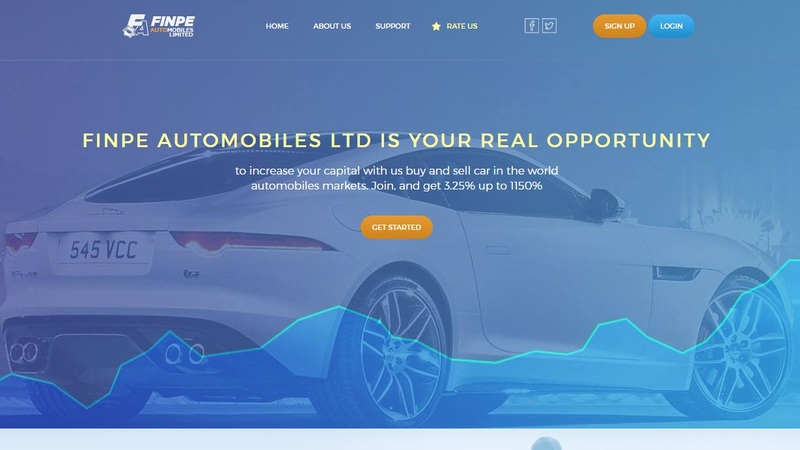 Finpe Automobiles is a stupid scam, there is no real trading activity going on, just a Ponzi scheme. Stay away from it! If you are interested in real investing, try a free demo account with a regulated broker and see risk free how it works. Don’t forget that in trading you can make, but also lose money, so be careful.